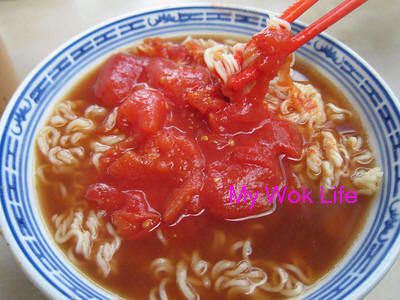 Tomato soup noodle with plentiful of stewed tomatoes. Yummy! Again, we came to know about this popular roadside stall through a TVB drama series. Smart me was wondering if the stall truly existed in real life, and online research shown that other than the stall name differs a little, the stall as well as its location was actually real! Among the popular items, this crispy crunch (脆脆) or known as crispy piggy bun (脆猪) has to be the limelight! 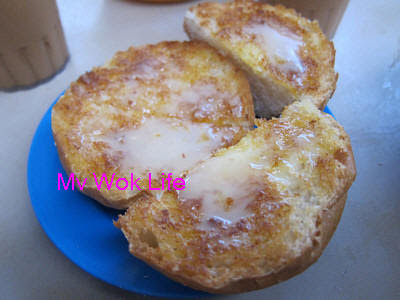 Crispy bun comes with choice of bun and extended choice of spreading, a game of mix & match. The most common selections would be lemon crunch, butter and condensed milk crunch, peanut butter crunch and pork chop crunch. 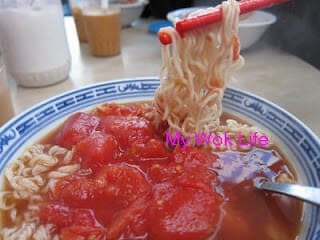 Beside the crispy bun, their signature dishes include the noodle (usually instant noodle or macaroni) in fresh tomato soup. Choose your favourite sides e.g. sausage, ham, luncheon meat, and etc, to go along! We were there during breakfast time. We thought it was the best time to enjoy their egg and ham toast. To order, say “Fo Tui Dan Ji, Hong Dai” 火腿蛋治烘底. 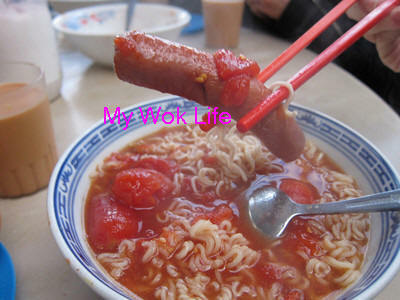 Tomato soup noodle with sausage: To order, say “Cheong Zai Kay Min” 肠仔茄面. If you prefer macaroni, say “Tong Fun” 通粉. Crispy “Piggy” Bun (it has nothing to do with pork, it’s just the plain bread loaf known as piggy bun), with butter and condensed milk. To order, say “Nai Yaw Choy Ju” 奶油脆猪. If you prefer wheat bun, say “Muk Bao” 麦包. As for our drinks, we had hot milk tea and hot Yun Yong (热鸳鸯, a mixed of coffee + tea). It was indeed a lot more exiting to eat at the roadside stall. Feeling so localized! Direction: It’s closer from Sheung Wan MTR which takes about 10 minutes to walk from there. It’s next to Gough Street (歌賦街). 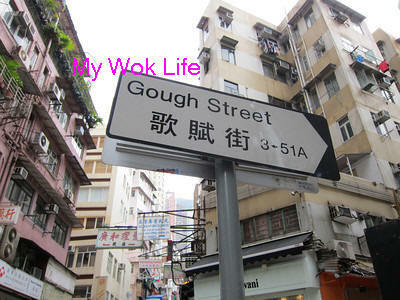 Direction Tips: It is located opposite the famous Kou Kee Beef Noodle (九記牛腩面). 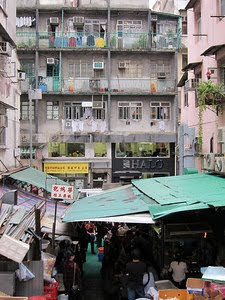 Also, the other end of the same street is Lian Xiang Lou Chinese Restaurant (莲香樓).